The Oppo F9 and F9 Pro are launching soon, and a recent teaser from the company revealed that F9 Pro is coming with VOOC charging and a notch design (the company is calling it a Waterdrop screen). 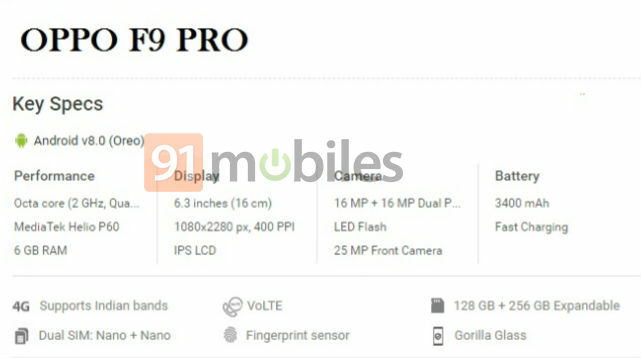 Today, 91Mobiles got the details of major specifications of the F9 Pro and looks like it isn’t going to be a major update from the Oppo F7. In fact, the chipset is going to remain the same and so are the cameras (there is a dual camera setup on F9 Pro, but the primary rear camera and the front camera remain the same). So, the Oppo F9 Pro has a 6.3-inch Full-HD+ display with a resolution of 2280×1080 pixels and hence, a pixel density of 400 PPI. The display has the Gorilla Glass protection as well, which is always a good thing to have. Under the hood, the F9 Pro is powered by the octa-core 2.0GHz MediaTek Helio P60 processor and the same chipset powers the Oppo F7. There is 6GB RAM and 128GB internal storage, that is expandable up to 256GB. The Oppo F9 Pro supports Dual SIM & 4G VoLTE, and there is also a fingerprint scanner. Finally, Android 8.0 Oreo runs out of the box, and there is a 3,400mAh battery under the hood with support for VOOC fast charging. The specifications seem promising for a mid-range smartphone but considering Oppo’s history of pricing, there are chances that we will see a price higher than expected. In India, the F7 is priced at Rs 19,999, and the price goes up to 27,000. So, expect the price of Oppo F9 Pro to be around Rs 25,000.